Autana - ARTE AMAZONIA provides a global voice through art for the indigenous cultures of the Amazon. New trailer: 'Autana - first ascent in the lost world'. to attempt a first ascent on the magnificent Cerro Autana. One of Britain’s top climbers has followed in the footsteps of Sir Arthur Conan’s Doyle’s adventure heroes with ascent to a South American ‘lost world’. 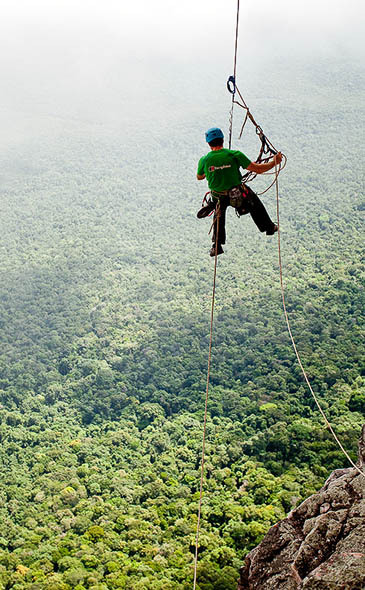 Leo Houlding’s climb of the Cerro Autana, the 1,400m table mountain which towers above the Venezuelan rainforest was filmed by cinematographer Alistair Lee for a movie to be released later this year. Cumbria-based Houlding has just returned from the trip during which, in contrast to his Baffin Island climb for the Asgard Project, saw him endure 35C heat, 100 per cent humidity and torrential rain. Mosquitos, a plethora of flies and a dozen different species of ants were an irritation whereas a more serious menace came from tarantulas, scorpions and deadly snakes. Houlding and his close-knit team of climbers and local fixers, and Alastair Lee, took on the complex and ambitious journey to make a first ascent on the impressive sheer face of the peak one of the Amazon’s most remote and sacred mountains. The expedition was supported by Berghaus. The climber was joined on the expedition by fellow Berghaus athletes Jason Pickles, Stanley Leary, along with local adventurers Yupi Rangel and Alejandro Lamus, and David Reeves, who works closely with Lee on his filmmaking projects. Cerro Autana is a spectacular quartzite-sandstone tepuy – a table mountain similar to the one supposedly still inhabited by dinosaurs in the Conan-Doyle book – situated deep in the jungle in the state of Amazonas in eastern Venezuela. The local Piaroa Indians revere it as the stump of the tree of life, from which all life grew. Due to its sacred status and close proximity to the porous Colombian border, access to Autana is prohibited and extremely difficult to secure on both a national and local level. After seeking a blessing from the local shaman and partaking in a memorable Yopo ceremony, they began a four-day trek through virgin jungle to establish a trail and base camp below the rarely visited east face of Autana. Once at the base of the wall the initial climbing involved as much vegetation as rock race and was slow going. As the rock quality improved, Houlding, Pickles and Leary climbed above the roof of the jungle and into the very rarely visited Cuevo Autana, the highest elevated cave system in the world. The cave provided an ideal wall camp, with running water, firewood, plenty of flat ground and a celestial view over an uninterrupted jungle wilderness stretching below the team. The steep wall above the cave involved climbing a tenuous line of corners, chimneys and hanging walls led for five pitches through giant ceilings with surprising ease, until a final six-metre horizontal roof forced a few moves of aid to reach the top of the wall. A couple of hundred metres more vertical jungle of a very different nature to that at the base eventually led the entire team to the elusive summit. 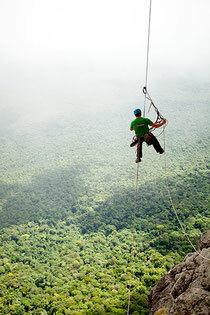 The team abseiled the line of the climb, leaving only their abseiling protection behind. Leo Houlding added: “It really was a journey into a lost world. “There were so many unknowns and hazards, once-in-a-lifetime experiences and unforgettable moments. If it were not for their extremely inaccessible location, the Autana Caves would surely be known as one of the wonders of the world and the top of Cerro Autana was an amazing place. “Tepuy climbing transpired to be everything we hoped for, everything that we had feared, and a whole lot more. Sean ‘Stanley’ Leary said: “Our voyage to the Tree of Life was a real boy’s own adventure. A film about the expedition is now in production and will be released later in 2012. Directed and produced by Alastair Lee, Autana – the First Ascent in the Lost World will tell the story of the expedition and include footage of some of the very rarely seen locations that the team visited.